Mizuno's marketing pitch: Neutral runners will love the simplified, smooth ride and refined fit. Upper: Spacer mesh, synthetic leather, hot melt overlays. 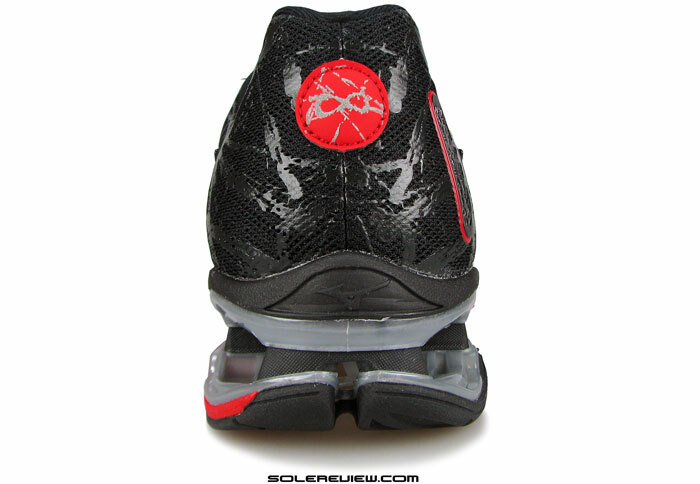 Midsole: Triple density foam, thermoplastic Wave plates separated in heel by rubber pillars. 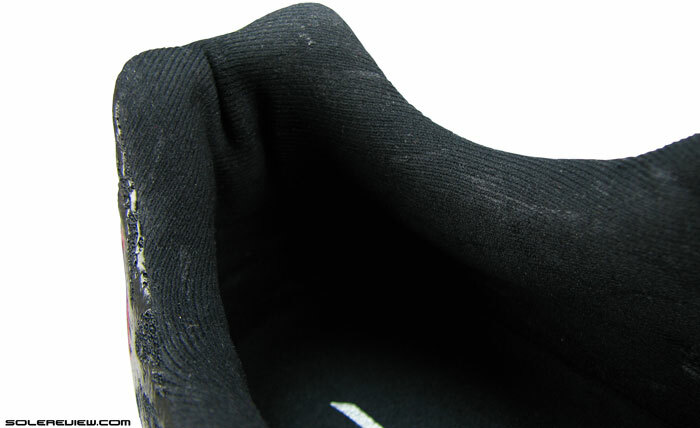 Outsole: Hard wearing carbon rubber in back, grippier rubber under forefoot. Widths available: Single (regular) only. The Infinity Wave platform is one of the last remaining ‘mechanical’ cushioning systems, which used to be popular in the last decade. This is our fourth Mizuno review, and so far we haven’t encountered anything such as a soft Mizuno. Even when the shoe is question has a hollow midsole heel propped up by nothing more than a rubber tripod. And yet, in the relative landscape of things, this shoe is one of Mizuno’s most cushioned, supposedly bested only by the more expensive Prophecy 4. But that has always been the way of Mizunos, hasn’t it? The brand has stuck through thick and thin to its proprietary ‘Wave’ shock absorption platform over the past couple of decades, producing a line of running shoes with a distinct ride signature. Fifteen years. That’s a long time. 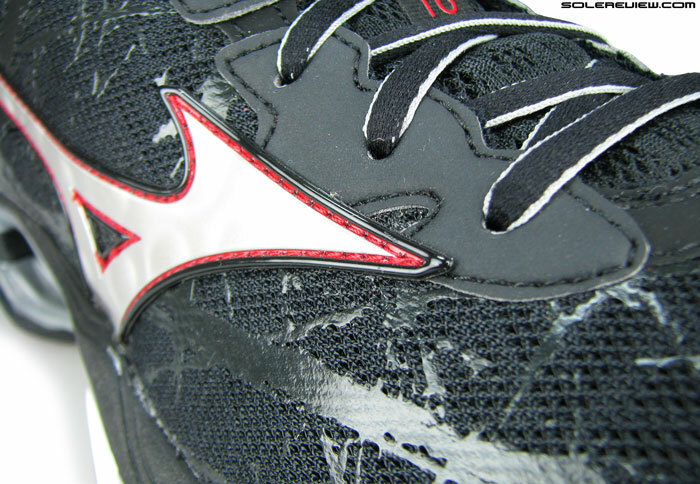 When it began its life 15 years ago, the Creation was introduced with goal of being the maximal representation of Mizuno’s Wave technology, which happens to be this hard, corrugated plastic plate embedded within the midsole. 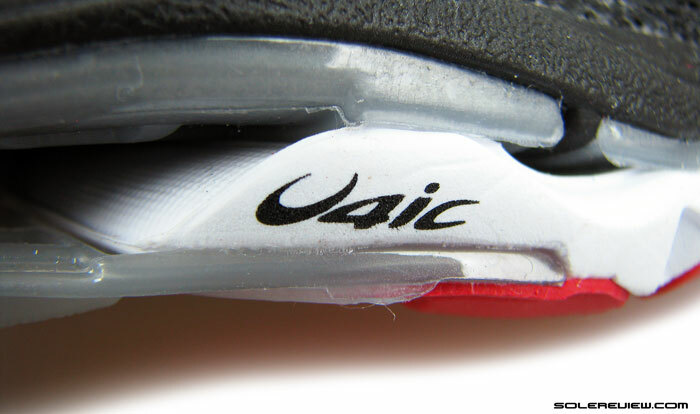 The Wave’s design objective, as we’d explained in our Rider 18 review, was to dissipate impact pressure without excessive deformation of the midsole. While most Mizuno shoes come with only one sheet of Wave running through, the Creation combines two hard plates together to allow a greater range of vertical compression under the heel. 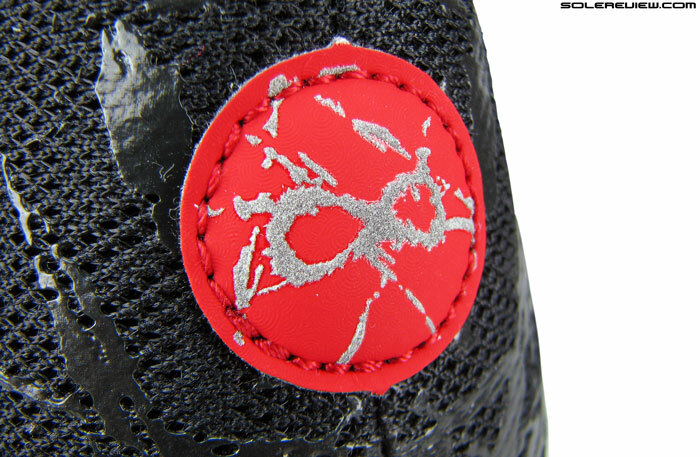 The reflective circular heel patch has the ‘Infinity’ logo, indicating the use of the two-plated system on Creation 16. The same logo is seen on the Prophecy 4 too. 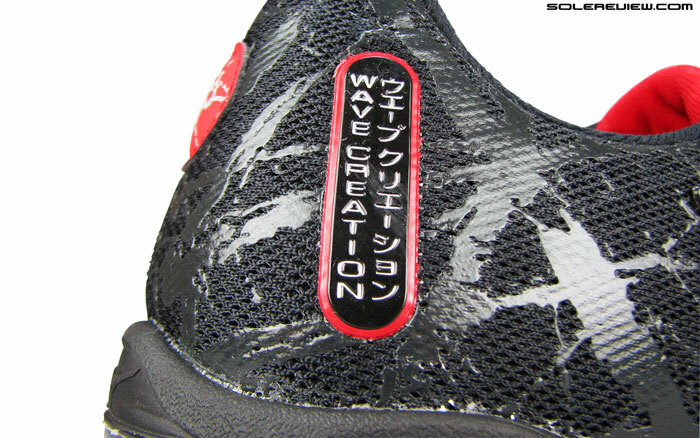 The current sole design of the Wave Creation has been unchanged, more or less, since the 2007 Creation 8, when the then low profile design evolved into a Wave Plate stack with a larger gap separating them. To prevent runners from knocking out their fillings, the plates are connected by rubber pillars which besides allowing the structure to compress, act as independent elements of cushioning. 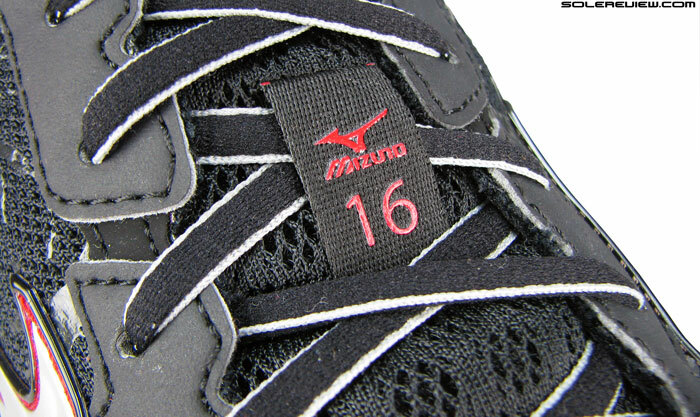 Mizuno calls this the ‘infinity Wave’, thus the symbol on the heel. You’ll also see this on the Prophecy, which is an extended version of the Creation 16. In other words, the Creation is a Prophecy half-fulfilled. They feel hard when worn at the running shoe store? Yes, they do, because you aren’t running in them. Compression tends to happen at greater impact forces. There’s a two-faced quality of behavior when you’re talking about the Creation 16. It feels like one shoe when worn on the shop floor, and another when you’re a few miles out into your run. It would be wrong to judge the Creation based on first impressions, because it feels firm and unyielding to body weight when walking around. But you really do need to take the Creation for a proper run before you can start tapping into its cushioning potential. For the Creation starts feeling more pliable under heel during runs, but at the same time one needs to look at the overall picture. The Pebax Wave plates are hard, and so are the rubber dampeners joining them. The midsole foam which sits on the Wave is also firm – everything is designed to deliver a firm ride, and that’s what the Creation is. It has cushioning, but without the squish or flattening out. 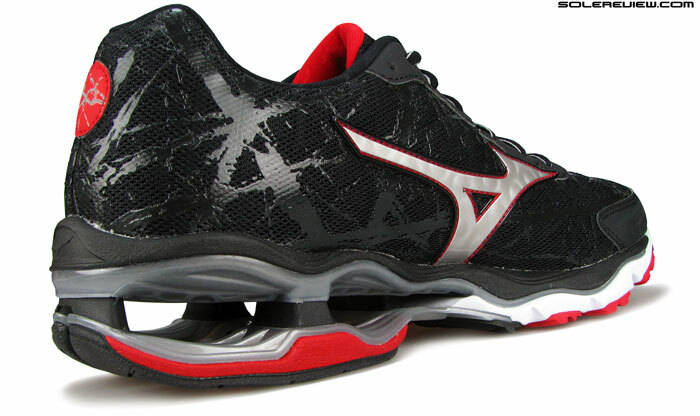 Firm, but with a greater level of snapback in the context of Mizuno Wave. …while the lateral side has no firm foam, but a splaying notch which helps transition. 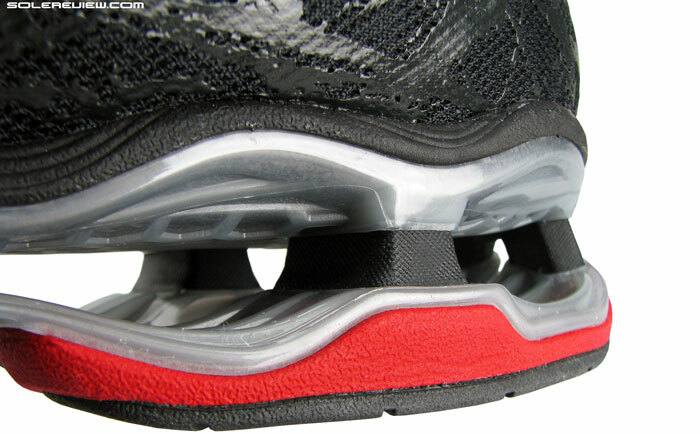 There are structural elements like a foam piece between the medial base (Wave) plate and outsole, and a pair of splay notches on the lateral side and heel center. The foam piece is right where usually a rear-foot striker would land, and hence designed to minimize foot strike jar. The groove helps in post foot-strike transition as it allows some amount of splay. Having said that, none of these make themselves conspicuous, but rather work behind the scenes. The complexity aside, what you really need to know is how the shoe feels overall. To sum up, the Creation’s a good shoe for runners who need a good level of heel cushioning, but without the sink or instability which usually follows as +1 to the party. Forefoot Wave has a split personality. Lateral side has these segmented sections, while the medial side is an unbroken line. Ok, what about the forefoot? The ride is as firm as Mizunos come, but this being the Wave Creation, the top plastic plate extends unbroken from heel to toe, sandwiched between two foam layers. The design isn’t symmetrical though. The lateral Wave edge has articulation (cutouts) built in, while the medial side has an unbroken surface. The midsole compression doesn’t amount to much since both the foam layers are quite firm, but there is noticeable splay of Wave plate under forefoot. 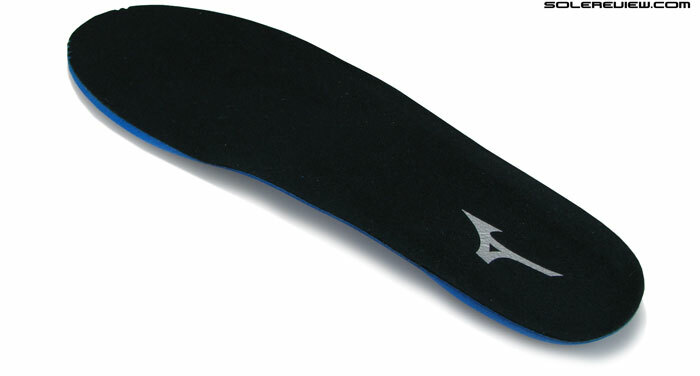 Part-shared insole cuts across most of Mizuno models, including yours truly. Great component, though. Smooth top fabric with squishy foam padding under. …which when magnified, looks like this. The splay will be felt more by forefoot strikers than rear-foot runners, and even if you run without the plush insole, you’d still sense the Wave plate splaying, so there’s no trickery here. The footbed is standard Mizuno-ness, found in the Wave Rider 18 and just released Inspire 11 and Prophecy 4. Silky smooth textile on top, memory foam kind of deal below. 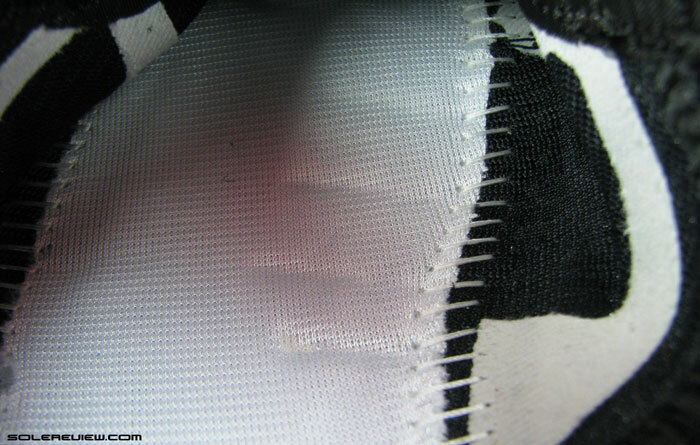 Notice the ridges only under the right (medial) side of the cloth strobel? 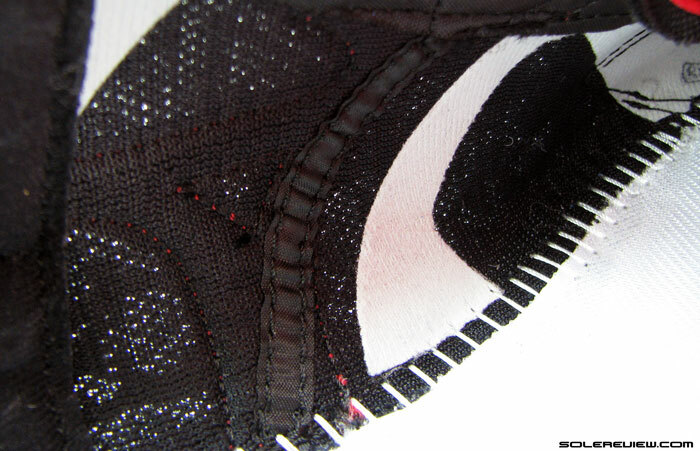 These are internal flex grooves built into the midsole foam, and the work together with the medial side of Wave plate. This is the method in which Mizuno has tried to compensate for extra flexibility coming from the lateral side. But really, you neither feel the lateral articulation nor the medial flex grooves. What you get is consistent forefoot behavior, which essentially is a combination of minor Wave splay, firm midsole overtone yet lined with some insole softness. Mizuno’s U4ic is a firm compound. Not very responsive either. For a shoe which has so much structural disparity between heel and forefoot, transitions come pretty good. That can be attributed to the firm ride, which prevents the heel of sinking in too much and thus paving the path for a smoother weight transfer. The forefoot’s inherent stiffness lends it a rocker motion of sorts, creating less work for the foot. While this would have helped quicker pace under usual circumstances, the Wave Creation’s mega heel and more-than-median weight (363 gm/12.8 oz) somewhat saps speed. The Creation’s got a generous amount of rubber under-spread. Heel has the ultra hard (and somewhat noisy) X-10 rubber deployed. Front is softer than the back, but this is much firmer than the usual blown rubber variety. 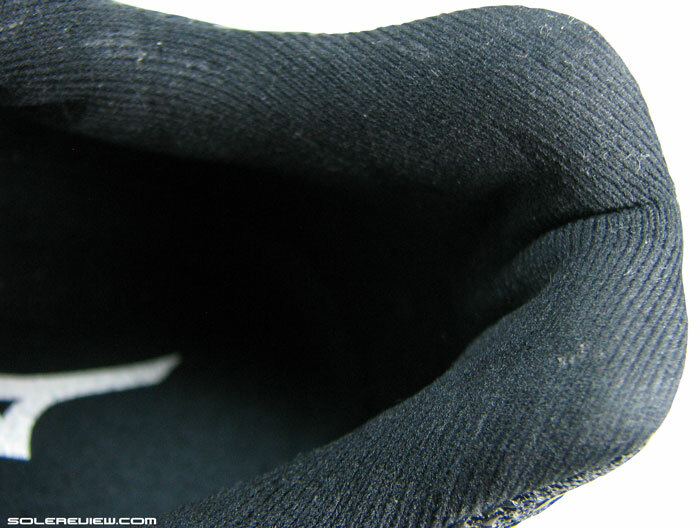 Outsole is fairly rugged, and hard. 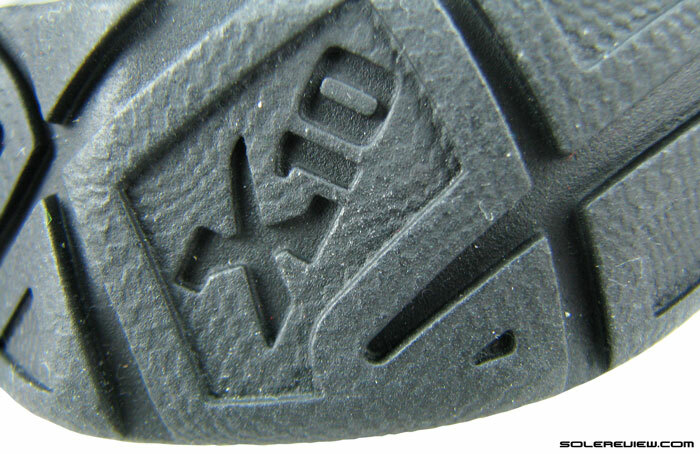 More so in the rear where the hard wearing X-10 forms a horse-shoe shape. In the front, rubber softer than X-10 provides grip, but still of a firm variety – far from commonly seen densities of blown rubber. It rained out during one of our wear-test runs, and the rear-grip deteriorated pretty quickly. Basic rubber science: hard is durable, but bad for traction. Soft is grippy, and does not have as long a life. 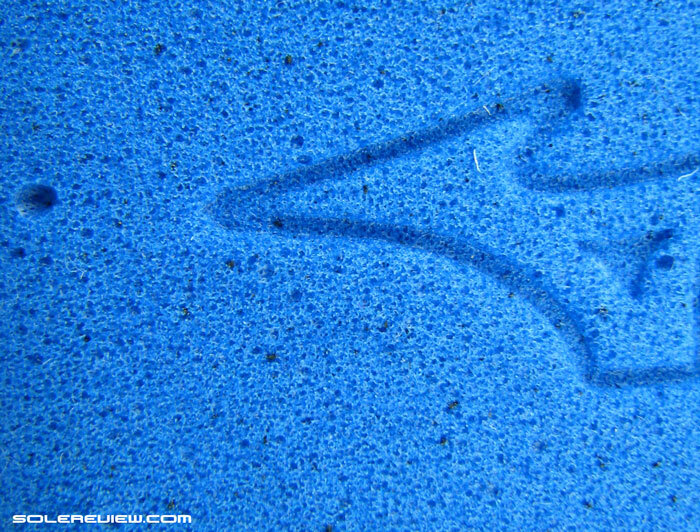 Brands or running shoes which combine both softness and durability together – bravo, but Mizuno isn’t that brand yet. Closest to achieving this balance would be the Nike Pegasus 31’s outsole made of recycled rubber. When in casual walking mode, the Wave Creation’s rubber is noisy on hard surfaces. But still better than Wave Rider 18; that shoe makes an audible din even during runs. 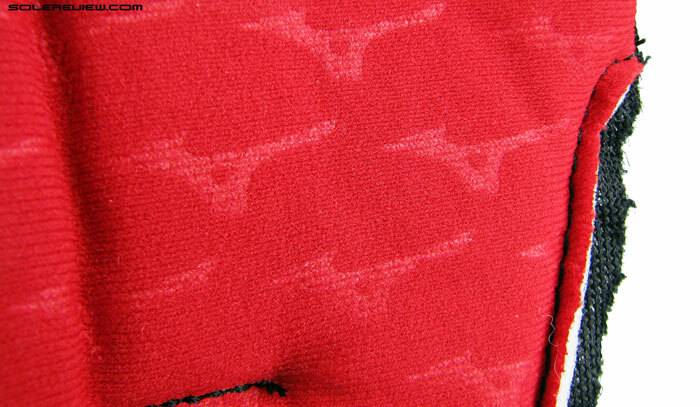 An identical upper pattern threads all current Mizuno running shoes. Toe bumper has the same design as what’s seen on Rider/Inspire/Prophecy/Sayonara etc. Ditto for the molded side logos and eyestay outline. 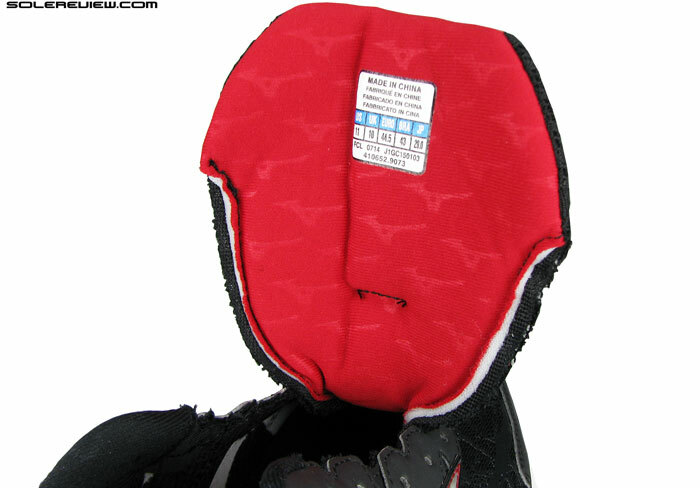 Collar textile and even the level of foam padding stays unchanged through most of the 2014-15 line. Upper is a draft off Mizuno’s design template for the current year. In a practice which no other brand does, Mizuno take a single upper design, and then clones them on all the shoe models they launch in a given year. 2014-15 is a good example of that standardization in practice. Look at the Wave Rider 18, Sayonara 2, Wave Inspire 11, Prophecy 4 and then compare it with the Creation. 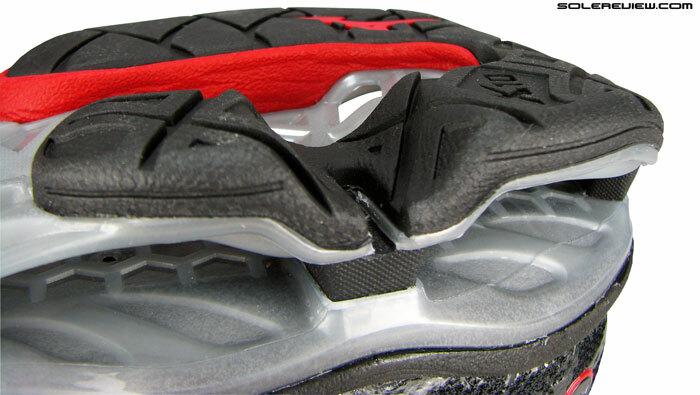 Near identical upper design, in this case formed by distinctly recognizable toe bumpers, laces, split eye-stays, circular heel patch, molded logos, and same tongue design. Wide, padded, free moving tongue. For some reason, it tends to slide sideways slightly. Spartanly foamed collar. The material is soft, while grip is average. Japanese art influenced (Ikebana?) designs on the mesh. The familiar sight of embossed ‘Runbirds’ hopping across the tongue and collar lining. Even the tongue and collar lining are exactly the same across many of their models. Yes, that also applies to both the $120 Inspire 11 and $210 Prophecy 4. The only spin here is the upper mesh, which can vary based on structure or textured treatment. In Wave Creation’s case, it is a soft mesh with a Japanese art inspired surface texture, achieved by the use of hot melt layers. Wonder if Mizuno uses the same last across many of their models and even the exact same size parts? Just a conjecture, but if it were true, it would be saving Mizuno a heck lot of cash. They are certainly achieving efficiencies by using same lining materials (and probably the midsole foam formula too). Upper fit is what’s expected of a Mizuno. Forefoot’s roomy, with a little lateral side snugness over the small toe. This is a shoe which runs a half size larger, so generally speaking you should be ok with buying a half-size smaller than what you might buy in other brands. In sizing terms, US 11 in Nike should translate to a US 10.5 in Mizuno. But this is a generalization, and you should try the shoe first before taking a call as foot anatomy might vary from runner to runner. Bad, bad seam. No barefoot running for you. The interior suffers from the same anti-barefoot-use ailment which Wave Rider 18 does. 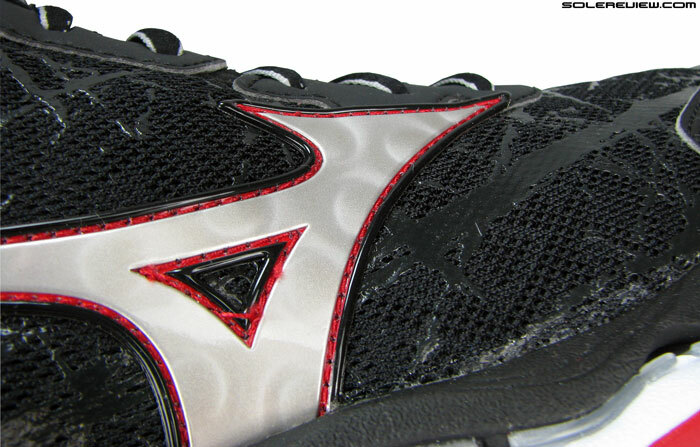 The mesh upper looks like one piece, but is actually two, joined by hidden seams under the Mizuno logos. There’s an underlay on the medial side, which has stitching running across, and these brush again the bare-skin. This isn’t a case of ‘might lead to blisters’, but rather sockless running will lead to one – there’s no questioning that. 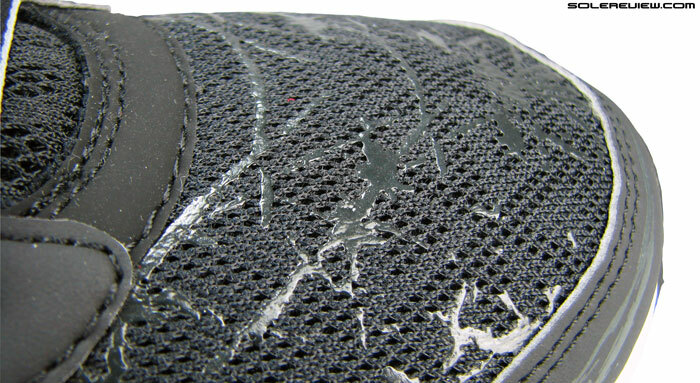 Much like the Rider 18, this is a pity since the insole feels absolutely heavenly when trampled on barefoot. Collar has anaemic padding inside, and though the foot doesn’t slip out, it might have felt better if the collar walls had more squish in them. 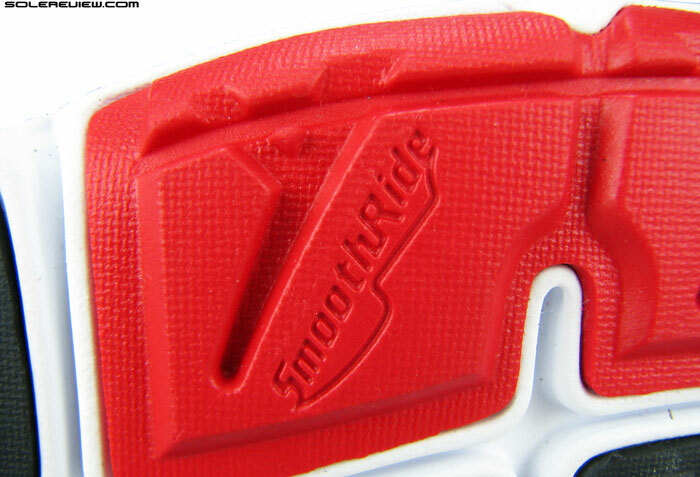 Molded TPU side logos have a neat texture. World of whorls. The reflective Infinity logo is the only luminous companion you’ll run with in the darkness of night. Among other smaller things, reflectivity is limited to the round heel patch, the TPU Mizuno logo has a nice holographic-eque whorl texture, and the Wave plate has an industrial, glue-like smell. This pungency was noticed in the Prophecy (past and present) too. Not sure what this is – extra strength adhesive, maybe? Anyway, this “Eau-de-Mizuno ” isn’t pleasant, and hope Mizuno does something to get rid of it. When it boils down to the basics, the Wave Creation feels very, very familiar when coming from other Mizuno models, with tons of commonality in upper construction, materials and overall design. Think of it as driving the same car, but with different Mizuno models representing swaps in suspension and tyre setup. Is it good value at $160? Can’t say so, but then, that depends on what the Creation is worth to you. Mizuno is confusing. I’ve ran in the Prophecy 4, the Creation 15, and the Rider 17. The Prophecy is supposed to be their most cushioned, followed by the Creation, but the Rider 17 felt more cushioned than both of them to me, especially in the forefoot. I ran in the Prophecy 4 once and said forget it, it’s to hard. The Creation 15 felt pretty good in the heel, but really hard in the forefoot. I want to like Mizuno’s because they fit my feet so well, but it’s hard to get by the firmness. How does the cushioning of the Creation 16 compare with the Rider 18? Thanks for you reviews, I enjoy them! Funny you said that, we were testing the Inspire 11 and felt some parts of the midsole to be softer than Rider 18, Creation 16 and even the Prophecy 4. When it comes to Creation vs Rider, the former has more compression in the heel. The forefoot feels firmer due to the Wave plate underneath, but has a splaying effect (or call it responsive, if you will) not found in the Rider 18. Did you get at least 50kms on the prophecies? I find that they change a whole lot in terms of firmness from about 50kms onwards. I find mine a tad neutral and soft now for my liking just because i got so used to the structure and stiffness at the start. Goes for all prophecies 1-3 for me. No I didn’t. I actually only ran in them once, it was either 3 or 5 miles. After that I gave them to my grandson because I felt they were too firm. After hearing this, “that they soften up” I wish I’d of given them more time. I really should have thought of this because I felt my Rider 17’s got softer after 70 or so miles. Thanks for the advice. I may have to give the Prophecy 4 another look. I really do like Mizuno’s, but like some softness. Pushing 100kms on my soon and man how they changed from the first 10kms or so. Im more surprised on the heel since i got used to the stiffness, and now they are a bit soft on the back end, close to my enigma which is supposedly Mizuno’s “cushiest”. Maybe after some use u could borrow them when your grandson’s around, just to see any developments in uour pair as well. Cheers! “In other words, the Creation is a Prophecy half-fulfilled.” Not sure if this works well as an analysis of the physical properties of the shoes themselves, but as an image, masterful. Longtime Mizuno fan, and the Prophecy 3 left me mystified. It ought to work better than it does but is bested at every level by the more orthodox Rider series (which costs half as much). Felt the same way, that the Rider easily bested the Prophecy. There are a few other examples of this. The $180 Nike Air Max 2015 feels a lesser running shoe than the $100 Pegasus, and not many run in the adidas Springblade or Gel Kinsei either. 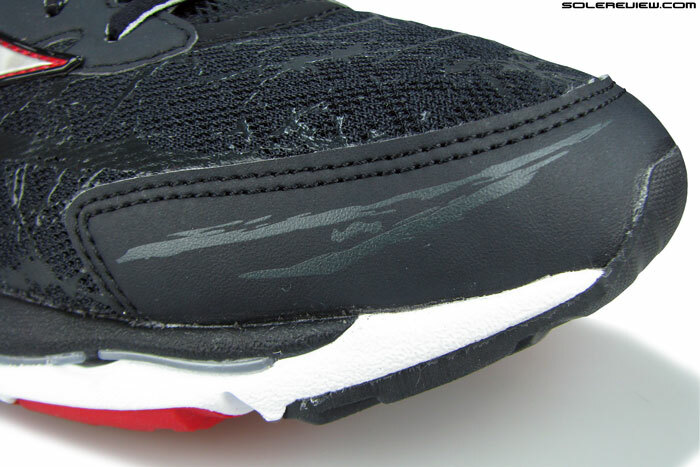 The firmness of Mizuno surprises most people, especially if coming from something like a Nike Air Pegasus. 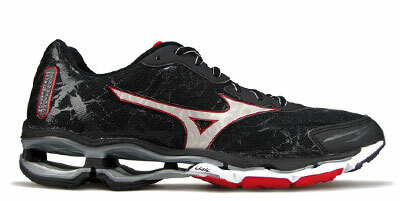 I loves Mizuno shoes, but also like a soft and responsive shoes. I find with Mizuno, they fit my very feet well and have just enough support to not let my gait fall apart on the final stretch of a full or half marathon. I actually like the firmness shoes like the WR18. It feels like I don’t have to work quite as hard. When I run in my Asics Excel 33 v3 or Nike Air Pegasus 30 because they are so neutral, I feel the softness and less support makes me work harder than I actually am. Can anyone relate to that? I believe the WR18 is the best version yet. The durability is great, but the heel seems to wear out a little faster. Does Solereview have plans on reviewing the Asics Excel 33 v3? I’m curious of your thoughts. I think it’s a great shoe, but the heel counter seems very sloppy while the forefoot seems perfect. Thanks for your great review of the WR18. It was one of the reasons I went ahead and got them. 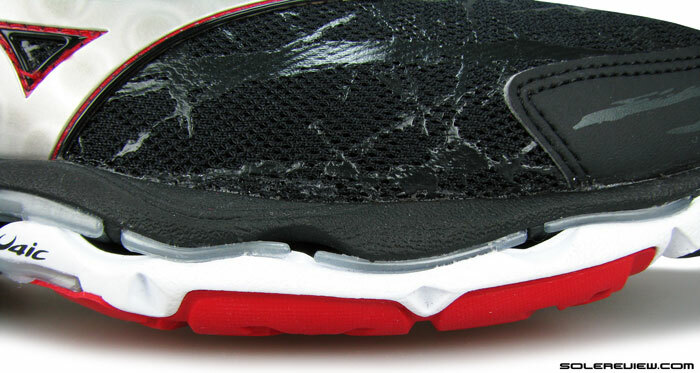 Mizuno thrives on its unique cushioning (or lack thereof) behavior, when runners want something firm to run in. We also agree that a firm shoe makes running more efficient – a good parallel would be racing flats, where a no-nonsense sole makes for good pace. We don’t have plans on reviewing the Excel 33 V3 – we’ll skip straight to the new 33M/DFA/FA models in a month or two. And as for the review, you’re welcome. Happy to note you found it of some use! I recently noticed that the creation 15’s have been marked down to $70. My favorite shoe i’ve ran in is probably the Adidas Microbounce. Would these be similar at all the the microbounce or do you have any recommendations on something that might be similar? Sorry, can’t say because we haven’t tried neither the Creation 15’s nor the Microbounce. This is a first, haven’t come across something like this before! Did you run more miles on the Creation after this comment was posted? How are the shoe behaving now? We would not worry unless the shoe becomes uncomfortable to wear, which could translate into loss of cushioning or stability. The option of return is always there to exercise, and you can pick up something like the Under Armour Speedform Gemini. I wanted to buy a Creation 16, but I’m having a hard time finding this model here. The stores are filled with the 17 though. Don’t know is there’s much difference between these two versions besides the upper mesh, but still… will there be a Creation 17 review? The Wave Creation 17 review is unlikely. Wave creation sells for $160….are these shoes really that better (in comfort, durability etc.) than nike or adidas like pegasus, lunartempo, supernova boost, flyknit etc…or just pricing standards are different? Not better in any sense. Just different tech, ride and feel.